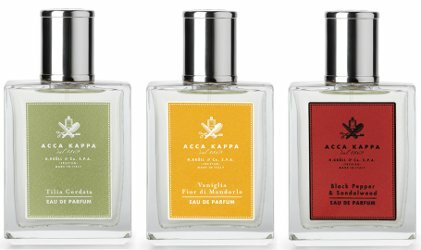 Italian brand Acca Kappa has launched three new fragrances: Tilia Cordata (linden), Vaniglia Fior di Mandorlo and Black Pepper & Sandalwood. Tilia Cordata ~ a green floral musk for women; with bergamot, lemon, petit grain, neroli, linden blossom, magnolia, jasmine, rose, cedar, amber, tonka bean and white musk. Vaniglia Fior di Mandorlo ~ a vanilla floriental for women; with bergamot, jasmine, almond flower, vanilla, sandalwood, amberc tonka bean and musk. Black Pepper & Sandalwood ~ a unisex spicy woods; with bergamot, elemi, davana, saffron, cloves, nutmeg, balsam fir, rose, cinnamon, black pepper, agarwood, patchouli, vetiver, sandalwood, cedarwood, cypriol and black musk. Acca Kappa Tilia Cordata, Vaniglia Fior di Mandorlo and Black Pepper & Sandalwood are available in 100 ml Eau de Parfum. Black Pepper sounds worth a sniff. Yes! Haven’t tried anything new from them for ages. Would like to try the linden too. Since I can never have too many almond scents, the vanilla and almond has my interest. I hope it’s a good one. They used to be very reasonably priced too. Don’t know if they still are. I love their Cedar one. I ran into a bottle of the White Moss a couple of weeks ago in Brazil (I was doing a week of training for a new job in Sao Paulo) but it was crazy expensive! I think it was because the place was a pharmacy/drugstore inside a fancy mall… I mean if I bought it online and had it shipped to Buenos Aires it would have been cheaper. Sometimes I am amazed of how people try to sell overpriced stuff as if there was no way to check the price, even on your phone!, with a couple of clicks. My sights are on the linden one too. will let you know if I get my hands on it. It’s reasonably priced here, when you can find it! I have been very happy with their soaps, too.